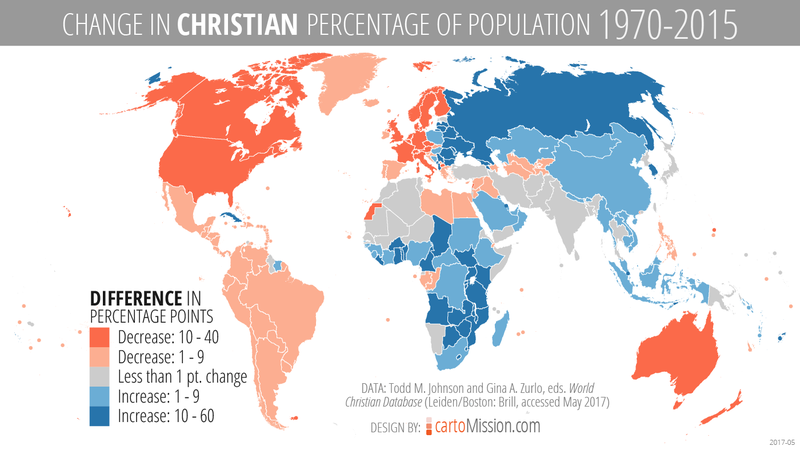 This map shows the changes in Christian percentage of population from 1970 to 2015, according to data from the World Christian Database and the Center for the Study of Global Christianity. Of the 20 countries* with the largest decrease in Christian percentage, 14 were in Europe (Netherlands, Czech Republic, Belgium, Austria, Germany, Switzerland, France, Macedonia, United Kingdom, Finland, Luxembourg, Denmark, Sweden, and Norway). Two countries were in Northern America (Canada and the U.S.), two in Oceania (New Zealand and Australia), one in Africa (Western Sahara), and one in Asia (Lebanon). All of the countries of Northern and Latin America, except Cuba (+14 points) and Suriname, saw decreases in Christian percentage. Of the 20 countries with the largest increase in Christian percentage between 1970 and 2015, ten were in Africa (South Sudan, Botswana, Rwanda, Zimbabwe, Benin, Mozambique, Malawi, Swaziland, Togo, and Burundi). Seven were in Europe, including three from Eastern Europe (Moldova, Russia, and Ukraine), three from Southern Europe (Albania, Montenegro, and Serbia), and one from northern Europe (Latvia). Three countries were in Asia (Armenia, Timor-Leste, and Georgia). There were 38 countries where the change in Christian percentage between 1970 and 2015 was less than 1 point (increase or decrease). The largest countries in this category include India, Pakistan, Bangladesh, Japan, and Iran.